He was a colossus among musicians, loved for his humility and simplicity as much as his mesmeric voice and talent. In a career spanning over six decades, he took the Kirana gharana and Hindustani music to a new high and earned fans among connoisseurs and ordinary folk alike. One of the most beloved and versatile musicians of our times has sung his last note. Bharat Ratna, Pandit Bhimsen Joshi passed away in Pune on Monday, the 24th January, 2011 after struggling with a brief illness. He was 88 years old. Source: The Times of India, 25th January, 2011. Sangeet ka ek mahakta suman taroo se tutkar dhara me mil gaya.jab tak srishti rahegi tab tak aapka naam amar rahega.aapke charno ka shat shat naman. This was an odd tribute to a great artist. The description of Mr. Joshi’s drunkenness has no place in a tribute or an obituary. It was a poor choice for anecdotes about this giant of Indian classical music. Much has been written about him in the past and in recent days, and the site manager could have easily created a more complete and useful piece. I hope that he/she updates the posting and improves it. By no means the author of this blog intends to show any disrespect to the departed soul. The excerpts were taken from the tribute paid by The Times of India, that appeared on 25th January 2011 in its Bangalore edition (mentioned at the bottom of the post). Fond memories of Pandit Bhimsen Joshi by his great fan and friend, Girish Karnad. The intention was to reflect the human side of a great artist and how he, despite all odds, struggled and maintained the purity of his art. It just my remarks on the one comment made here on Girish Karnad’d anecdote. Pt Bhimsen Joshi received Bharat Ratna and all possible recognitions and Awards, but above all..He was an exceptional artist and a human being. If we accept his art we have to accept him the way he was. It is Girish Karnad who is quoted here or in TOI, and it is an artist on an artist. Who doesn’t need to be a hypocrite after someones demise. It is said to show his human side and his commitment to art. We are now suppose to compare great artists like jasraj, sumar gandharva and all. But we are not blind so we can not say difference between the sun and light bulbs. Pt. Bhimsen Joshi was, is and will always be the sun of classical music. He will remain alive in his renditions forever. it was typo…..i meant We are “NOT” suppose to compare great artists like jasraj, kumar gandharva and all. Each time one listens to the GREAT PANDIT BHIMSENJI one is transported to another world. His music is divine and he will live on till the end of TIME if there will be ever an end of TIME!!! His bhajans and abhangs will give ANANDA, revive BHAKTHI and wipe out DUKHA every time one listens to his voice. He indeed is AMAR AND SHATA SHATA PRANAAMS TO HIS MEMORY!!! I convey my all respect to this artist of artists. kya baat hai updation nahi hui blog mein. pl.make available all concert live mehfils for hearing. pandit ji meanes indian classical , he is not a only BHARAT RATAN HE IS WORLD RATAN SPECIALY IN FILE OF CLASSICAL RAGA BASE SONGS. 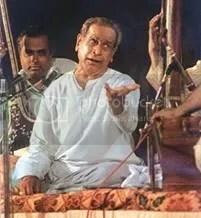 Pandit Bhimsen Joshi aavaz ka shant dariya he aap apni naav leke aayiye aur aankh band kar ke maza lijiye raga ki maujo ka…. Met him for the last time in December 2011 at his house. He gave me a deep look for about 30 seconds. Once his son tried to remind him who I was….in reaction his last words that will never leave me until I live were….extremely loud…….Hey Raaaaam….GOvinDaaa…….and slowly the wheel chair was taken back to his bedroom……. The most remarkable Indian musician-saint I was lucky to know, spend some time and travel with. Such Mahaan Atma are sent by God to fill the Earth with Love,Sweetness and Anand for the suffering Humanity.Na Bhuto Na Bhavishyati. Koti Koti Pranam.